It's noon when she answers this interview. It's Friday and she's enjoying the sun and her day off. This young coach has completed a degree in economics and administration and she is currently working as a financial analyst in the real estate sector. In addition to coaching a team, she is also very active in the development of the sport. How did you discover synchro? I was skating in singles at the age of 14 when I was invited to join the first synchro project in Latvia run by our current Skating Association President Marika Nugumanova. Before that, I had never seen or heard about synchro. I skated for a season or so and then continued with singles skating. Before the WSSC 2012, I was asked to join the team 2 months before Worlds, as the team was missing a skater. What is your background in the world of synchro? 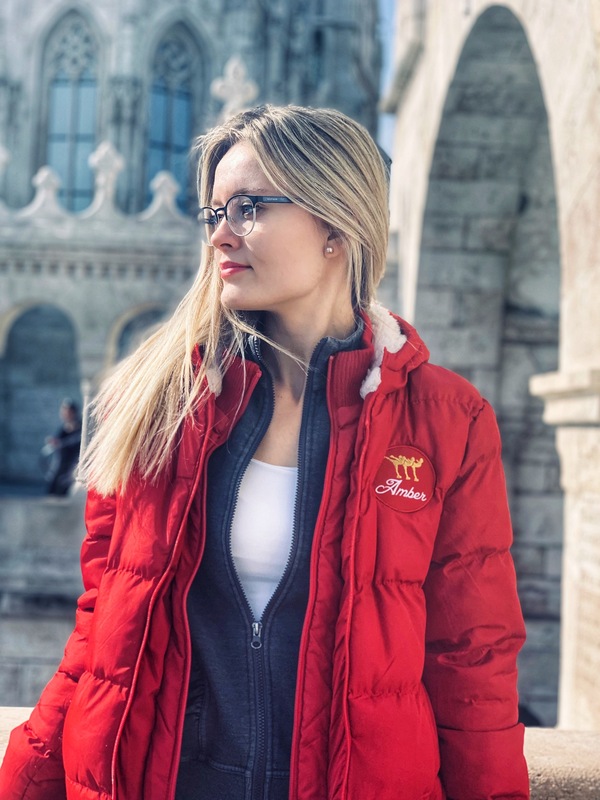 I have been coaching the ISU senior team Amber for 2 seasons and this is the first season that they have little sisters - our juvenile team, Amberlight which I am coaching with Anna Orlova. Before that, I skated for Amber and was team captain for several seasons. What is your best synchro memory and why? My best synchro memory was this year when my senior team woke me up at six o'clock on my birthday morning - we were in Zurich, Switzerland skating for our biggest partner, the Dinamo Riga hockey team. 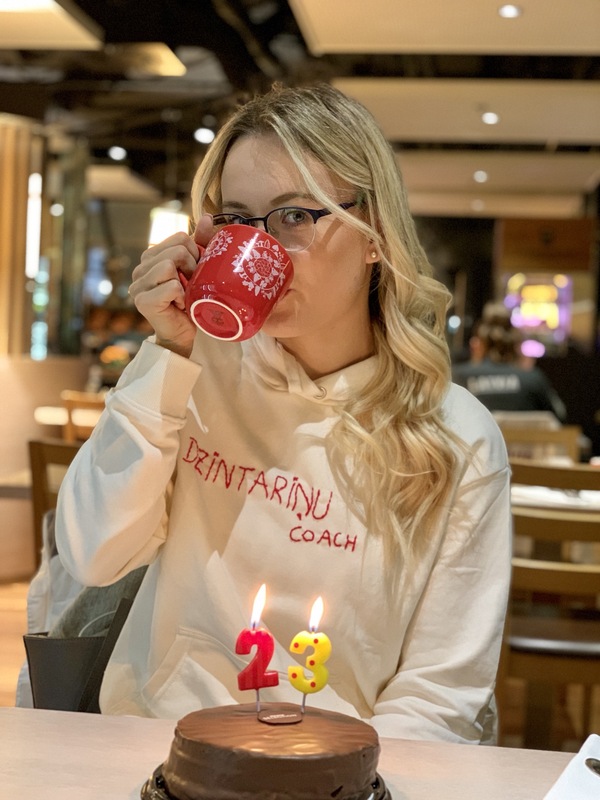 They were singing "happy birthday" and handed me a sweater cross stitched during the night with the text "Dzintarinu coach," which is a sweet nickname I have given to the team (Dzintars-Amber in Latvian). The best synchro memory at a competition this year was Amberlight winning gold at the Hevelius Cup; this is their first season and I am very proud of their achievements. If you had to remember a program that affected you, what would it be and why? I have always enjoyed the performances of Team Surprise, and Andrea Dohany has always been my inspiration. The program that affected me the most was their last free program. I was honoured to see them perform at the World Championships and it was breathtaking. Another program that I loved was the Rockettes short program to Schindler's List; the smoothness, flow, and unison seemed heavenly for me. The costume I was most proud to wear was our short program dresses for the program Welcome To My Country (2016). This program was very special for us - the music performed by the most popular Latvian band Brainstorm just gave us wings. We are a small nation with only 1.9 million inhabitants, and the concept behind the program was to show Latvia abroad. The pure white dress with a national belt made me feel patriotic and honoured to represent my country in competitions, especially at the World Championships. What did this sport teach you? Synchro has taught me that you can do so much more with a team than you can when you are skating alone, and that team spirit is a key to success because you have 16 times the amount of happiness or pain compared to when you are alone. You are certainly one of the youngest ISU senior coaches, how do you feel? I am glad and honoured that at such a young age I have accomplished that and that the skaters rely on me, but at the same time I feel an incredible amount of responsibility for my teams. What is your coach's touch? I could say that I am a calm coach with a loud voice, and I value my skaters and their efforts at the practices. I am very thankful that they are so motivated and manage to combine skating with their studies and work. I do a lot of planning before the practices as we have very limited ice time, I usually have a minute-by-minute plan at each practice. I am often consulting with judges and experienced coaches and I am very thankful for their advice as it helps me and my teams to grow. Which advice would you give to young people who want to start synchro? I would advise them to do it right away; synchro is such a great sport! It combines skating and teamwork, it requires courage and persistence, and at the same time it gives you the best emotions with your teammates. It is beautiful for spectators and fun for the skaters, and you never skate alone. Also, I think synchro helps shape great personalities because it brings out your best qualities, and teamwork teaches you how to cooperate with others toward achieving a common goal. Do you have any rituals before a competition? Yes, we have team slogans for both Amber and Amberlight which we scream before the team enters the ice. Also, we have a clapping ritual just before Amber steps on the ice. When your team takes the ice at a competition, and you hear their name being announced, what is going through your mind? I am honoured, I am happy to see my girls in beautiful dresses and I know how much of a great job they have done to be here in this moment. Of course, I cross my fingers hoping that they will show off their best performance, but mostly I want to see them enjoying what they are doing. What’s your favorite element and why? My favorite element is the line, especially a pivoting line. I think it is a REAL synchro element, and it looks incredibly great when the line is strong and synchronized. I love it! Another element that is not in use anymore - the circular step sequence. I remember that we had it for Worlds 2012 and I think that was a good looking element. I wish it would come back someday, or that we can choose whether to do the NHE in a block or circle shape. Can you tell us a bit about this team? Amber was founded with all singles skaters 7 years ago. The team went to the World Championships in 2012 and split up afterwards. It has taken great effort to introduce synchro in Latvia. In the next few years, Amber attracted singles skaters to synchronized skating, as there were no other synchro teams or clubs in Latvia. Currently, Amber practices 3-4 times a week, and we have ice, fitness, and choreography classes. I love the skaters' attitude towards practices and each other. They have a great team spirit and always skate to their best ability. This is the first season Amber has competed in several international competitions before the World Championships. Can you describe your both programs this season? SP: In the short program we have a circus theme from Cirque du Soleil. In the program we hop on the train, say goodbye to our families and friends and become part of a great carnival with our teammates. I love the pace of the program, it is very quick and puts everyone in a great mood. FS: This year's free program is the best program we have ever had (so far :)). I love the elegant dresses and the music from the film Suicide Squad. The story of the program is about women being put under the pressure of stereotypes and fighting against the pressure of society. Our goal is to get our intersection levels counted, because we have experienced bad luck there :)). But the main goal is to perform our best at the World Championships, skate clean, enjoy every second of this amazing event, and of course, to improve our scores. For me the goal is to attract more skaters to synchronized skating and do my best work for them. I am inspired by positive emotions and the success of my skaters. You’re doing a lot in the development of synchro in Latvia, can you explain the roles you have there? Yes, I am trying to spread my passion and develop the sport in all possible ways. I am a head coach of the only synchronized skating club in Latvia. This year we have grown significantly - we changed the rink where we were practicing and we are trying to develop a pyramid structure to have synchro teams in all age categories, not just seniors as it was before. 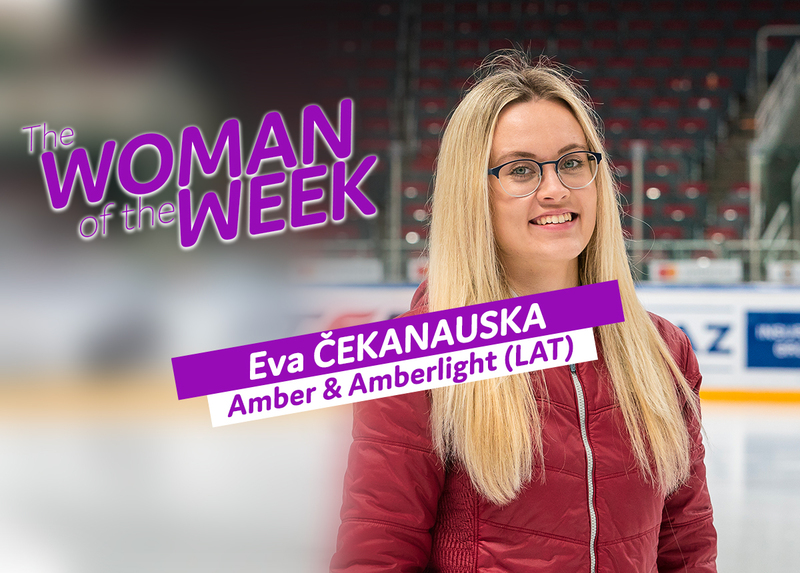 We are attracting skaters of all ages starting from 4 year old beginners to adults, and at the moment we have two competition teams - ISU senior team Amber and a juvenile team, Amberlight which I am coaching together with Anda Medne and Anna Orlova. Many people in Latvia don't know this sport, so we spend a lot of time taking part in projects, advertising ourselves, collaborating with hockey teams, etc. This season, Latvia hosted its first ever ISU synchronized skating competition when the Riga Amber Cup 2018 took place in Riga, Latvia. It was an incredible achievement and I am very thankful for everyone who helped make this event happen. We hope to see many great teams at the next Riga Amber Cup, which will be held December 13-16, 2019. Since you have been involved in this sport for many years, what are your views on this sport today and its evolution? I am very happy to see the sport developing; it is becoming more and more interesting and challenging with each season. Since we don't have deep roots of synchronized skating in Latvia, sometimes it feels with Amber that we are running behind the train. We improve with each season but the sport evolves and other teams are doing a great job as well. However I am very grateful that nothing stays in one spot because then life would be too easy and boring. I love challenges. I see synchro developing in other Baltic States, and there are mixed age teams in Lithuania and Estonia as well. We have been collaborating during this season and I hope that synchro development in all Baltic States will increase its popularity. In your country, how is the development of synchro going? What has been created to promote this discipline of skating? I am coaching Amber for the second season so I am very happy about what we have done. Two teams, an ISU competition, youngsters growing. I could not be more proud about what has been done. Of course, I have already made my 5 year plan for synchro development; this is just somewhere around second step in the staircase and we are definitely going further. In your opinion, how can this sport evolve in Latvia? The financial support from the government is a huge issue in Latvia;unfortunately almost everything has to be paid by parents or skaters themselves and it sometimes discourages skaters. I really hope that we will be able to grow, attract sponsors, and someday our ISU senior team will have to pay nothing for their skating. Also, I hope to see some other teams in Latvia. It would be great if someone else founded a juvenile or mixed age team for example, as this would develop the sport. We have also started the process of judge education, so I hope that after some time we will have at least 1 synchro judge in Latvia. I would like to wish all the synchro coaches a lot of creativity for upcoming season, a lot of energy and commitment to all the skaters, and best of luck for all senior teams competing at the World Championships! Over the years, I have been working with synchronized skating teams, organizing, communicating and promoting this sport. 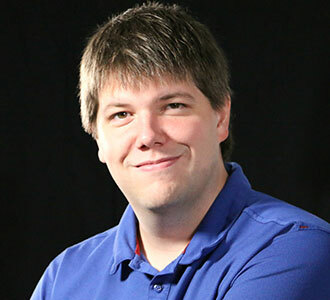 After graduating with a Bachelor's degree in Computer sciences and working as a reporter in the media for several years, I specialized now in the world of video. Surrounded by several people, we found that it was important that synchronized skating has its own media and develops its community.